Fees may apply (Friends members-reduced or waived fees). Registration required. Please call the park (518)793-0511 to register or for more information. 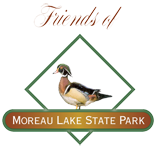 Please check www.FriendsofMoreauLake.org as dates draw near. Like us on Facebook!